This recipe is inspired by two Dublin sister restaurants, JoBurger and Crackbird. JoBurger was the first place I ever tried sweet potato fries, and I’m pretty sure the first place that sold them in Dublin, back in the dark days at the end of the Celtic Tiger. It was a pioneer of the casual gourmet fast food scene. It was and is a place where the menu told you they had put a lot of care and attention into it, but it was served in a setting where the music, decor and nonchalant staff feel more at home in a club. A lot of places offer this now, but JoBurger to me remains the best for a very simple reason: they know their food (with a hat-tip to Bunsen, another Dublin burger place that keeps their food game on point).Dublin is rife with gourmet fast food places passing off frozen oven chips, supermarket burger buns and pulled pork slathered in hot sauce to disguise the lack of flavour who looked at the business model, but forgot to factor in the food knowledge. This recipe recreates the sweet potato fries from JoBurger with the whipped feta dip from Crackbird. The sweet potato fries are a little different, coated in polenta to keep the outside crispy, and smoked paprika and chilli to add a bit of heat. Feel free to add more paprika, I use even more than this when I’m making these for myself, but not everyone is as mad for it as I am. If you can’t find wild garlic, you can substitute with a finely chopped clove of garlic. Peel the sweet potatoes and cut them into finger sized wedges. Mix the polenta and paprika together with a decent amount of salt and pepper. Toss the sweet potato fries in a large bowl with 1-2 tablespoons of neutral oil, then add in the polenta mix and toss well to coat the fries. Lay them out on foil lined baking trays so that none of the sweet potato fries touch each other (you will need to do this in batches) and roast in the oven at 190C for about 20 minutes until the fries are crispy and browned on the outside, and soft in the middle, carefully turning them halfway through so they crisp evenly. Meanwhile, burn the lemon half on a hot pan until blackened and completely soft on the cut side (you can also skip this step and use the lemon juice straight up). 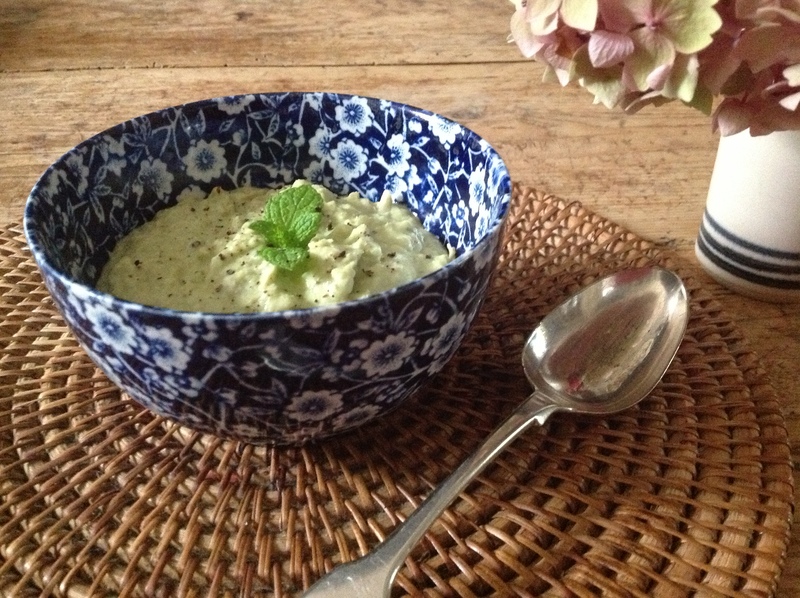 Crumble the feta into a bowl with the yoghurt, wild garlic and spinach and blend with a stick blender until smooth. Add the juice of the burnt lemon, and the honey to taste (I like things very citrusy, so I usually scape all the lemon flesh in, add it slowly until you get the taste you like). Serve with the warm sweet potato fries. I know, a recipe called chickpeas and kale is the kind of thing you will only click on in the depths of January guilt. It sounds bland, and unnecessarily wholesome. But bear with me. I had seen the recipe for chickpeas and spinach in the Moro cookbook dozens of times while leafing through it. And I had ignored it. Every single time. It sounded boring, it didn’t involve cheese or tahini and I worked off the logic that there were so many amazing recipes in there, there also had to be some duds. I was wrong. Every recipe Sam and Sam Clarke turn out is consistently wonderful, and often deceptively simple. When this recipe appeared on Food52’s Genius Recipes column, and again on Smitten Kitchen, my interest was finally piqued. I’m trying to get back into the swing of cooking quick and easy work meals after a long Christmas break, and this recipe fit the bill. I adapted it extensively from the original, using a different spice combination, white wine vinegar instead of red, kale instead of spinach and added some tomato sauce (inspired by Smitten Kitchen). It’s easy, wholesome and inexpensive to make, which is perfect for January cooking. You can prepare the bread paste in the advance and keep it in the fridge, so the whole thing can be assembled in about ten minutes. When I first cooked this it was at the end of a twelve hour working day which had been followed by a cheeky pint. Every route to my house from work involves passing at least one chipper so I felt like I should get a medal for cooking this at 9:30pm. I can’t properly articulate why this recipe is so good, because I can’t wrap my head around it. It’s some magical alchemy involved in the combination of the sharp vinegar, rich breadcrumbs, earthy chickpeas, mineral kale and the, well, garlicky garlic. This is a recipe I can see myself making again and again. Makes two generous main course portions. 1 teaspoon mild chili flakes, like aleppo chili. Heat 1 tablespoon of olive oil in a frying pan over medium heat. Add the bread cubes and fry until golden, turning frequently. Add the garlic Herbes de Provence and spices and cook for one minute more, stirring frequently. Remove from the heat, and blend in a pestle and mortar, or with a stick blender together with one tablespoon vinegar to form a paste. Wilt the kale in batches in a hot frying pan with a little bit of water to prevent burning and a sprinkling of salt, then leave aside. Add the bread paste to a frying pan together with the chickpeas and tomato sauce and cook for 5 minutes over medium heat to combine well. Add the wilted kale and cook for a few minutes until heated through and well combined. Top with smoked paprika and serve warm. Just what the internet needs, another toast recipe. I met up with an old friend, now living in San Francisco this week. Among many other things discussed over sunny pints, the topic of the tech booms transforming our cities and hipsterfication of everything came up. It reminded me of a story I heard on This America Life on the origin of the San Francisco artisan toast trend that seems to make up 50% of Instagram right now. You’re probably rolling your eyes right now, but the story is both inspirational and sad. It originated in a cafe called Trouble, which is run by Giulietta Carrelli, a woman who struggles with schizoaffective disorder. She set up her cafe as a lifeline, against all the odds, after years of living rough. It was a way to stay connected to her surroundings and to interact with people and have a support network. Everything she sells is something which has helped her through the worst moments of her illness in some way. She started selling toast because it represented comfort and home. You can read the whole story here which I’d strongly recommend doing rather than going on my very flawed summary. It’s a nice reminder that people are more than the sum of their troubles. Black pudding is something that will always remind me of Ireland, and home, so I’ve included it here. You could also use chorizo, or just keep it veggie if the idea of blood sausage is too creepy. This recipe makes about a cereal bowl sized amount of pea guacamole, it’s an easy thing to whip up quickly to share with friends. Blend all the ingredient 6 ingredients, and check seasoning. Add chilli flakes if using. 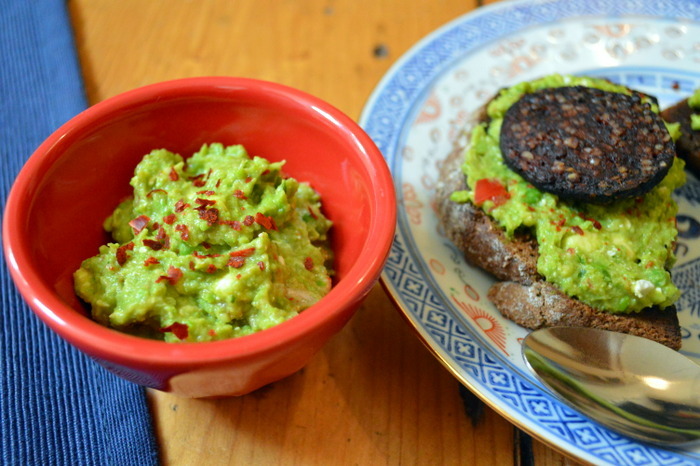 Fry some slices of black pudding, and serve the guacamole slathered on toasted bread with warm black pudding on top. Ireland is a small country, both in size and population. What this means in practice, is that everyone knows everyone. When you meet someone for the first time, you will inevitably try and work out who you both know, and will almost certainly succeed. Facebook has of course helped with this, but there is also the old school approach of “oh, so you’re one of the Borris-In-Ossory Murphy’s, Sean Murphy is my dad’s cousin”. It’s a stereotype, but it is also very very true. There are whole swathes of counties that you can discard from your potential dating pool due to the high risk of everyone there being related to you. This is kind of inevitable in an island, and is part of the reason Ireland has higher rates of genetic illnesses like coeliac disease. As a result of this, Irish restaurants were doing gluten free dishes long before it was trendy. So, this is a vegetarian, coeliac friendly recipe to celebrate Paddy’s day. 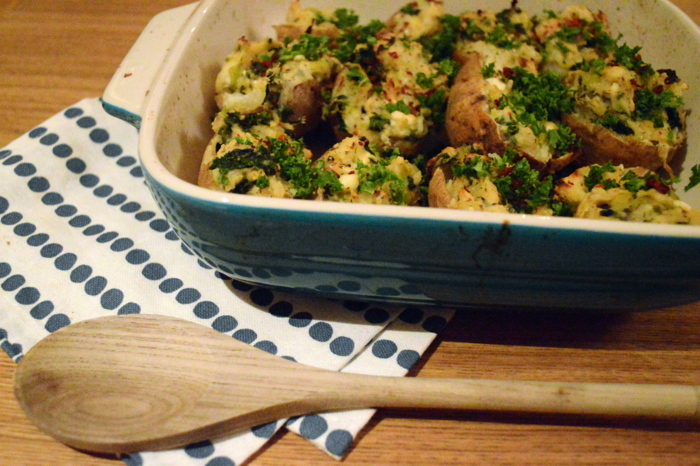 These twice baked potatoes are an update on colcannon, a traditional Irish potato dish made with mashed potato and kale or cabbage. Then I added a Greek flavour, courtesy of my stalwart fridge ingredients, feta and greek yoghurt. 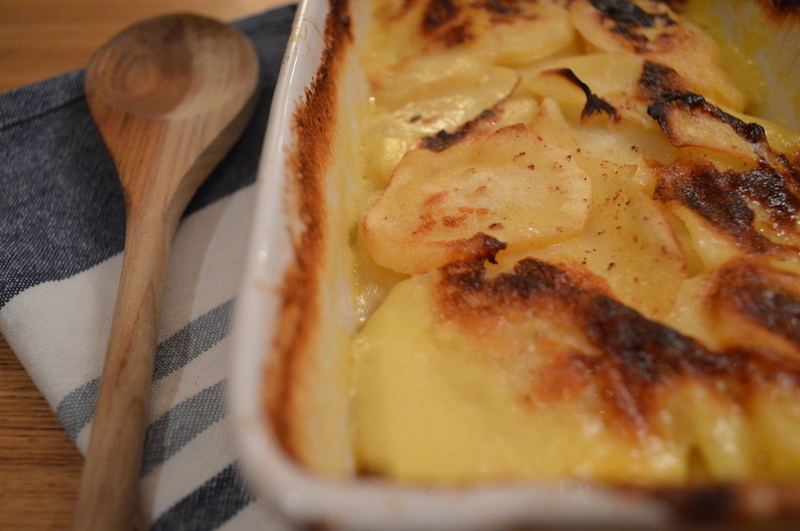 Poke some holes in the potatoes with a fork and bake at 180C until cooked, about 45 minutes -1 hour depending on size. Meanwhile, saute the leeks over the medium heat in some olive oil for 5 minutes. Add the kale and cook until it’s wilted and the leeks are soft and starting to turn golden. When the potatoes are cool enough to handle, scoop out the middle and add to a large bowl, leaving shells with just enough potato to give structure. Mash the potato in the bowl with the yoghurt, salt and pepper until smooth. Fill the potato skin shells the potato/kale/cheese mix. You can either freeze them now to cook later, or go ahead with the next step. Bake in the oven at 180C for 15 minutes or so, until the top starts to brown and crisp. This has become my go-to after work weekday meal. It’s genuinely quick and easy to make and you can have all the basic ingredients lying around your store cupboard. Every time I cook Chinese food, I wonder why I don’t do it more often. Growing up, Ireland was the place which pioneered the three in one (fried rice, chips and curry/sweet and sour sauce) as a staple of Chinese takeaway food so it got a bit of a bad reputation as stodgy junk food. Pretty much all of our restaurants were Cantonese then, although the idea of regional cooking was still a long time away. It was living in Melbourne that opened up my eyes to all the different types of Chinese food. Now Dublin is leaps and bounds ahead of what it once was, and I actually tried this dish for the first time here, in one of my favourite restaurants, M&L Szechuan. 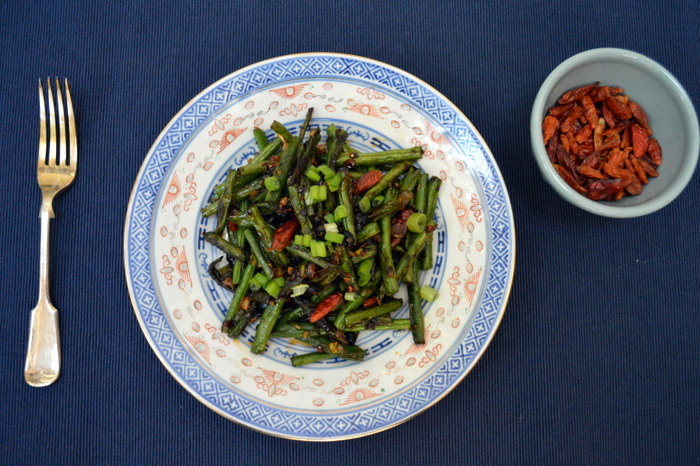 The general method and the first sauce are adapted from the beautiful Appetite for China website. The second sauce was made as part of an impromptu dinner on New Year’s Day, when all the shops in Holland were closed, and we were working off whatever we could find around the house. It turned out really well, and just has the kind of ingredients the odds are you already have lying around. You could use any kind of hot sauce instead of sriracha really, its all about getting the balance of sweet, spicy, salty and sesame together. Trim the beans and chop into 1 inch pieces. Make sure they are completely dry before frying. Heat the oil over medium/high heat and add the beans. Fry, stirring frequently for about 8 minutes, until the beans have some brown blistered skin and have softened. Meanwhile, make the sauce by mixing the ingredients together in a bowl. Remove from the heat and drain on some kitchen paper. Add the ginger, chopped spring onion, garlic and birds eye chillis into the pan, and cook very carefully over low heat for 1-2 minutes until fragrant (burnt garlic is the absolute worst, I tend to alternate taking the pan on and off the heat to be extra careful as I have a gas stove). Add the sauce to the pan and stir around to mix. Add the beans back in and cook for 2 minutes to combine all the flavours and reduce the sauce a bit. If you’re not a fan of overly hot things, fish the dried chilis out before eating, they are pretty fiery to eat. If there is one phrase which sums up spending Saturday night at home in your twenties, it’s FOMO (fear of missing out). As an addict of Facebook, Twitter and Instagram, the decision to have a quiet night in is faced with a barrage of photos of everyone you know having the best time ever in an array of locations that don’t involve their sofa.As my twenties creep to a close, the battle with FOMO is slowly being won by the need to catch up on sleep and save money (my 22 year old self would have snorted with derision at this). That doesn’t mean I can’t make a night in as just as detrimental to my health and waistline as a night on the town. This dish is the kind of dangerously unhealthy thing I can’t justify making on a regular basis, but every now and again, when I want a treat, this is the way to go. This should serve four as a small side dish. Butter a medium sized gratin dish or any oven safe dish. Heat the cream with the garlic, thyme, peppercorns, and nutmeg until it’s starting to boil then leave to infuse for 10 minutes. Layer the onion and the parsnips in the dish. Season the cream and pour over the parsnips. Bake at 200C for 30-40 minutes while wrapped in tinfoil, checking with a fork after 30. You want the parsnips to be al dente. Cook uncovered for an additional for an additional 15-20 minutes so the top can crisp (keep an eye to make sure it doesn’t burn). Leave to sit for 20 minutes to settle before serving. An unusual little shop opened on the slightly desolate stretch of Dun Laoghaire Main Steet near the People’s Park recently, taking the place of a perenially empty Indian restaurant. To the untrained eye, it looks like a slightly spartan newsagent, but inside it’s filled with a selection of all the random things a Guardian reader could need. Family members have sourced Sheridan’s cheese, olives, and tamarind paste in recent weeks along with fresh vegetables like baby aubergines and okra. Recently they’ve been selling glorious Irish broad beans (fava beans) for next to nothing and today I bagged myself a kilo out of the sheer excitement of seeing them. Broad beans scream cliches like ‘summer in a bowl’ and ‘fresh and healthy’. Which is what you need when your last meal was a mountain of chips from the fantastically named ‘Legends of Dun Laoghaire’ chipper at stupid o’clock. Unfortunately, if you’ve had an evening where garlic cheesy chips seemed like a good idea, the chances are the next day isn’t going to be a very productive one. Sunday afternoon laziness kicked in. So I turned them into a lovely dip, the ultimate in lazy cooking. This is quick and easy to make and moderately healthy. Shell the peas, and boil in their skins for 3-5 minutes in a medium saucepan until soft. Add the remaining ingredients, and blend. The puree won’t be completely smooth, but shouldn’t have any big chunks. Check the seasoning and serve with warm pitta bread. 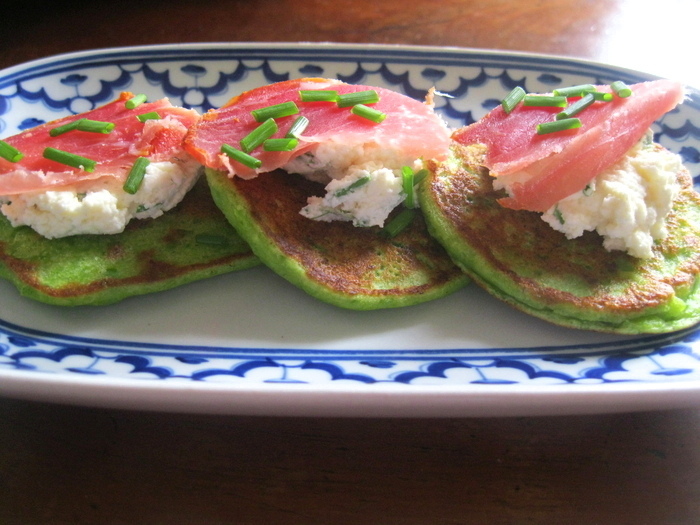 These pancakes are adapted from a recipe by Domini Kemp and serve as the perfect base for turning Christmas leftovers into a nice brunch or light dinner. If your house is anything like ours, you are looking at a fridge filled with cold ham, turkey, stilton and smoked salmon guarded jealously by a cat. Christmas for us involves two Christmas dinners, one on actual Christmas hosted by my aunt and uncle, and another hosted by my family the next day. By the 27th I’m usually sick of the sight of Christmas leftovers and looking for a bit of a change. The pancakes are quick and easy to make up from ingredients you probably have around the kitchen. I made some blini sized ones with herbed whipped feta and iberico ham and brought them as canapes for pre-Christmas drinks with friends. I’ve also had them with goats cheese and leftover Christmas ham, and with turkey and stuffing as a light dinner. Cook the frozen peas for 1 minute or so in a pot of boiling water until soft. Submerge in cold water to cool and stop cooking. Meanwhile, mix the remaining ingredients together in a large bowl and whisk together to combine, seasoning well. Add the cooled peas and blend with a stick blender. It’s ok if some of the peas aren’t completely blended and have a bit of texture. Heat some neutral oil over medium heat in a large frying pan. Cook for 2 or so minutes on each side until they are golden brown. Remove from the pan and drain on a plate lined with kitchen paper. Serve warm or at room temperature with your topping of choice.